I am seriously, entirely, so incredibly EXCITED to share this with y'all. As you all know, I was in Columbus, Ohio attending the eTech Ohio conference. This is the 2nd largest technology conference in the US, and let me tell you.. it is AWESOME! 1.) My district has a license for Moodle purchases and it is accessible to me. 2.) I have heard so many great things about teachers using Moodle. 3.) I WANNA TRY MORE TECHNOLOGY IN MY ROOM!!! And the list goes on. So, I got out my handy dandy highlighter, and got to work picking my sessions. When we got there, they had this GREAT Guidebook App where I just added my sessions to My Schedule, and BOOM... reminders, updates, everything was on my iPhone. Yes, after sitting through 3 information sessions before lunch on Monday on Moodle, I couldn't stop thinking that this program would be WAY to hard for my fourthies. Not to mention, incredibly time consuming for me to create meaningful lessons. 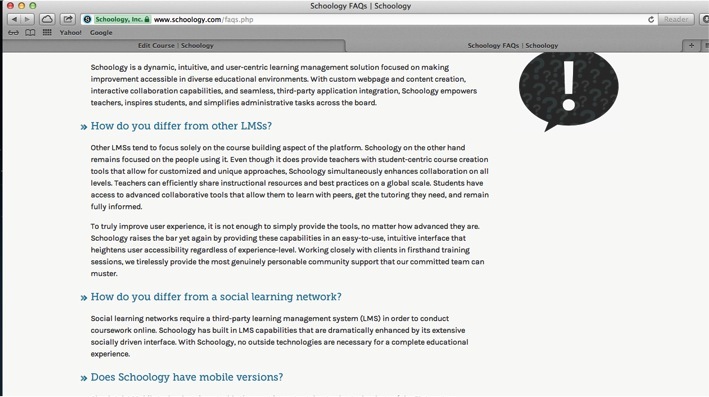 I watched speakers struggle to navigate through the site to show different things to do, I heard COUNTLESS teachers ask questions because it was so hard to understand how to create things, and I stared at the UGLY (yes, I'm sorry Moodle, but your site is SO not aesthetic) website that is cluttered and so not fun. First off, it's a pretty nifty giveaway. It's restickable for the back of your touch screen device, and then you take it off and rub it on the screen to clean your screen. It works pretty neat. 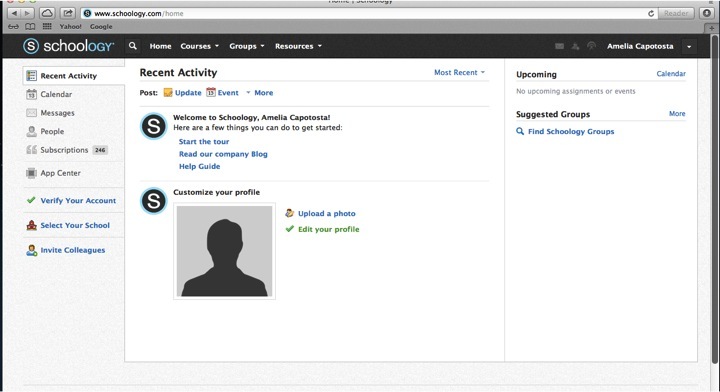 This my friends, was given to me by an LMS company called Schoology, and THIS is when I had my revelation. 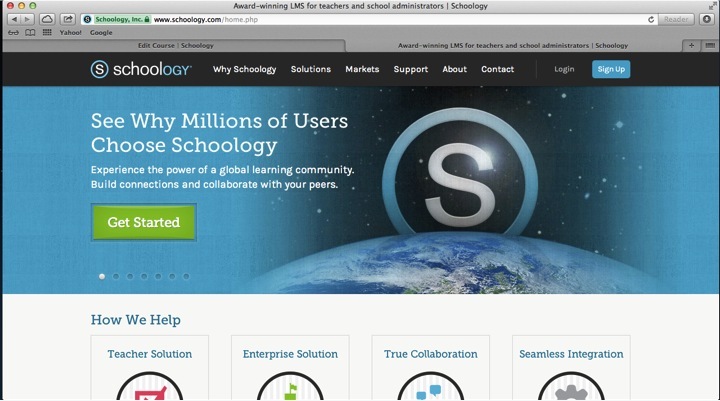 I quickly betrayed my Moodle devotion, and opted to absorb as much information about Schoology as I could! I got home from the conference last night, and created my account right away! I am going to launch it in my classroom next week. I will use it during my listen to reading station in Daily 5, and also as a homework/interactive tool. I will go into detail about my journey with this program throughout the school year, sharing with you my ups and downs, loves and hates (I sure hope they're aren't many of those!) 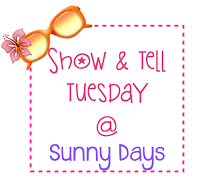 So let's start it off with a little Show and Tell of what it's all about and how to link up. I am warning you now, there are many screen shots coming, but it's great to see what you can do! Here's a screen shot of their homepage, and the login screen after I created an account. Here is where my first love for the product began.. it looks JUST like Facbeook. ...Seriously, can it get more engaging for students than a classroom Facebook?! 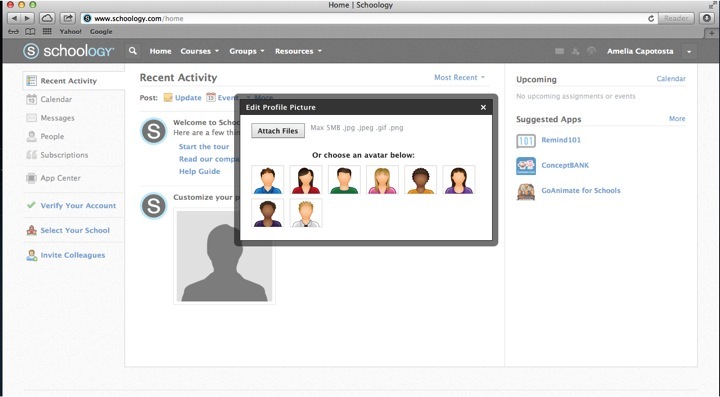 After you create your free account, you can choose an avatar, or upload a picture for your profile picture. You then have the option of taking a page tour, that shows you what each feature is going to be used for. It is great! And students have the option of doing this, too! The website has a wonderful FAQ and help page, that can help you with all of the amazing things you can do with this site. I started by making my courses. I made 4 courses, one for each section of my LA class, and one for each section of my SS class. I then chose to add my students myself. Now you have the option on the right hand screen of requiring an access code for users to join your class. I would recommend that you do this. I chose to do so. I also chose to create my students accounts for them. If you have older kiddos, you could probably give them the access code and leave it up to them to create their username and password. However, I wanted to make it easy for them to remember, so I pulled up their Study Island accounts and created an account for each student, and added them to their class. This only took me about 15 mins per class, and I have 28 kiddos in each class. The best part? You have to approve for them to join. So they can't just give the access code to whoever! Requests look just like friend requests on Facebook. Again, too cool! I am also going to offer the option for parents to join and make their own account using the access code. 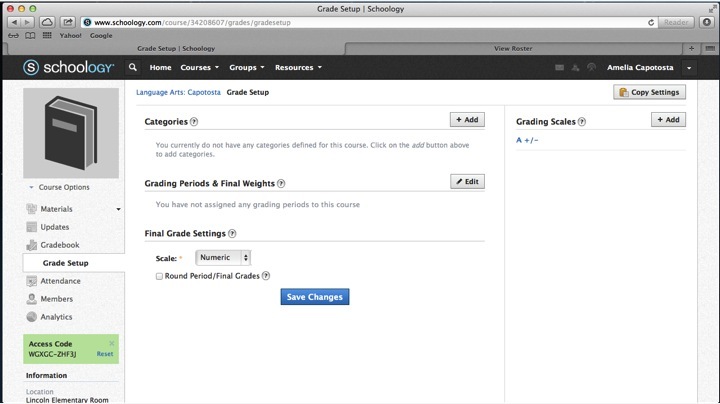 There are options to choose which features, assignments, quizzes, etc each user sees. 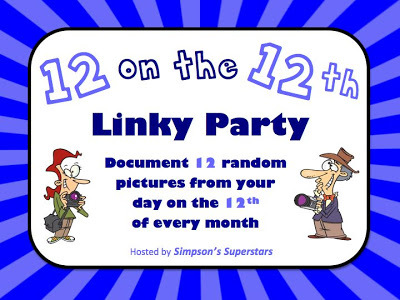 This is great for differentiation, but it's also great so parents can have their own login where they can't complete assignments, but can see them! 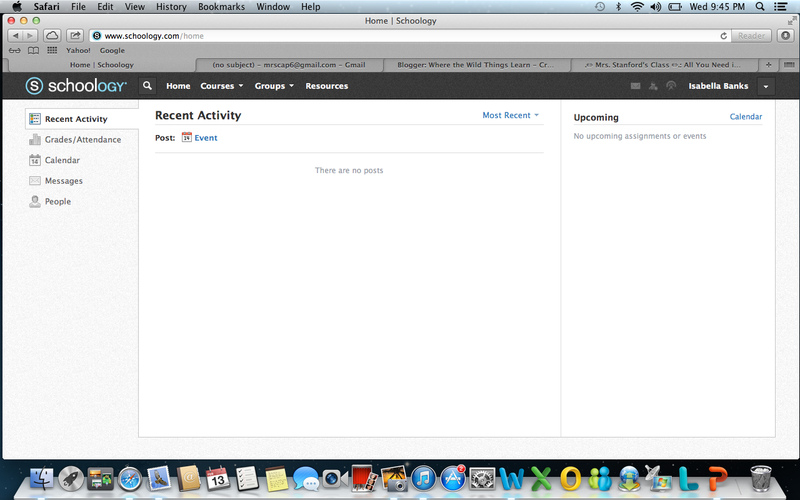 Here's what the class homepage looks like for an admin. 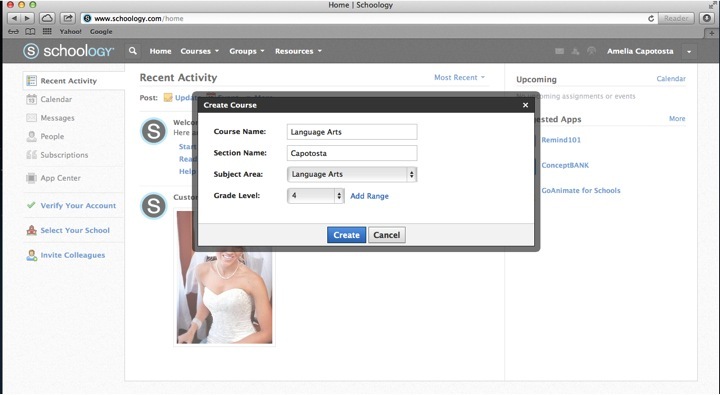 You can see here all the options you have to create assignments, test/quizzes, upload files, start discussions, upload photos, create pages, add videos, it is incredible! Another wonderful thing is that you have complete control over moderation. No comment can be posted without your approval (unless you choose to change the settings on that.) OH THE POSSIBILITIES!! Literature circle discussions, reading response questions, vocab quizzes, videos of lessons, posting homework for the kiddos who lose it. The list is endless. 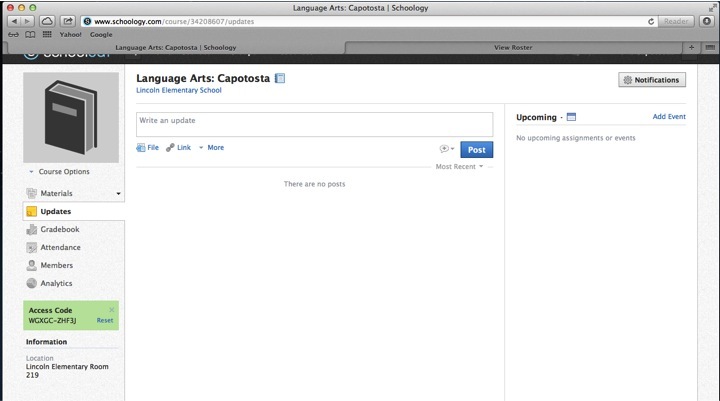 When students or parents login they will see a running feed homepage, exactly like Facebook. This is where you can post informal discussion questions, homework for the night with file linked or without, upcoming events, you name it. It is as easy as posting a status update. 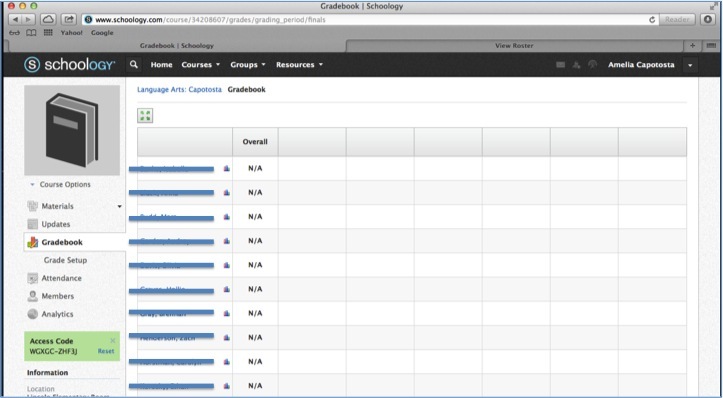 And there is an electronic Gradebook to see students grades. I've only played around with this for a little over 2 hours, and I've learned all of this so far! I can't imagine how much more there is so explore and I CAN'T WAIT to start it with my kiddos! They are going to LOVE it! 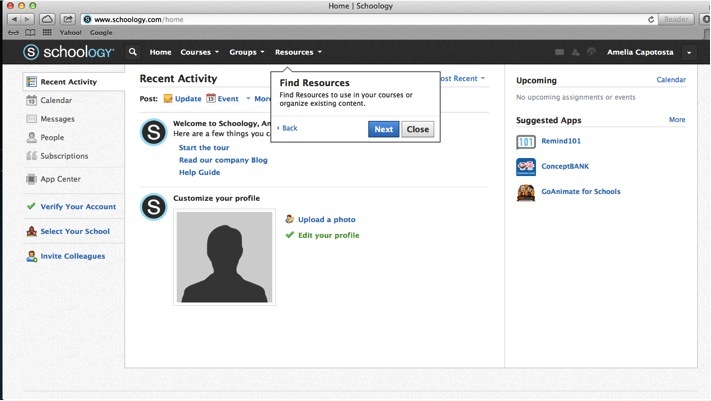 Stop back in my blog to see updates on how this is working in my classroom and head on over to Schoology to create your own account! Have a great day of love with your kiddos tomorrow! :) I have been using my ELA Valentines Pack and my kiddos are LOVING it!